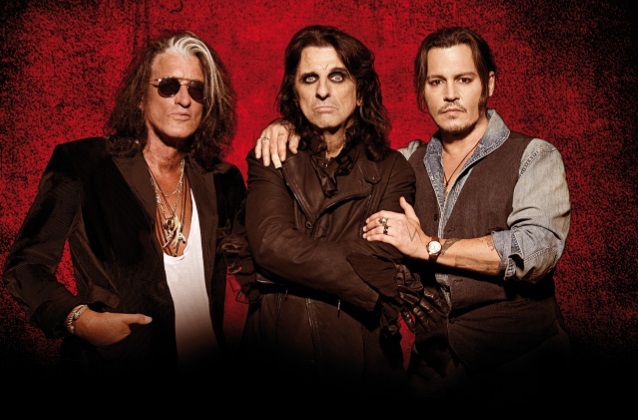 HOLLYWOOD VAMPIRES, the supergroup featuring international film star and musician Johnny Depp alongside Alice Cooper and AEROSMITH's Joe Perry, will embark on a U.K. tour in June. Support at all four shows will come from THE DARKNESS and THE DAMNED. Cooper told the Evening Standard that fans will be shocked when they hear Depp play guitar. "He's not new to playing on stage," Alice said. "People are going to be very surprised when they hear him play, because they know him as Jack Sparrow. "When they see a guitar in his band, they going to say, 'Wait a minute! I didn't have any idea he could play like that.' He's a real guitar player. I wouldn't be working with anybody that wasn't as good as anybody I've worked with normally. "Last year, we were testing the waters to see if people were even going to be interested in what we were doing, and we found that they were; we got great reactions and sold out quite a few places. I think a lot of that might have been out of curiosity — Joe Perry, Johnny Depp and Alice Cooper; what a weird combination." During the 1970s in the upstairs bar of the Rainbow Bar & Grill on the Sunset Strip in Hollywood, the "Hollywood Vampires" were born. It was a gathering place where celebrated artists such as John Lennon, Keith Moon, Jim Morrison, Alice Cooper, Harry Nilsson and countless others would meet and drink into the early morning hours, and the club became legendary. Back in 2012, Cooper and Depp decided the time was right to revive the camaraderie and spirit that defined Hollywood Vampires" (minus the drinking), creating an environment for great artists to hang, laugh and play together. Cooper and Depp were joined by Perry, along with producer Bob Ezrin, and soon the recording began. The band's debut album, "Hollywood Vampires", was released in September 2015.